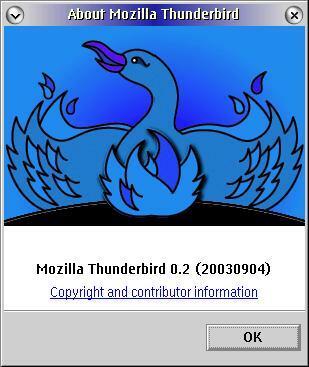 A number of members have had difficulties installing and running some builds of Mozilla and its progeny, Firebird (formerly Phoenix) and Thunderbird. Actually, one of these members was yours truly a couple of months ago while doing a SCOUG demonstration. Many of you will recall that I couldn't get the IBM WebBrowser version 2 (really a Mozilla 1.3 build) to coexist with Mozilla 1.4. Shame on me, of course, but it did not inspire confidence in the group at how simple it is/should be to get Mozilla versions up and running. Well, as it turned out, my handy dandy little command file to run Mozilla 1.4 was pointing to the wrong partition, with predictable results. You should know that doing this in front of a large group of people can really make a presenter feel like he/she is on the cutting edge of nerdom. Yes sir. For a brief nanosecond, I was afraid that I was doomed to having to use Microsoft products as a sign of penance. Anyhow, as I was fooling around after the presentation trying to figure out what the heck I had done or not done, it seemed like a good idea to do an article (not to mention try another presentation) for the user who is having difficulty installing, or is afraid to install, or doesn't want to be bothered with installing, the latest builds of Mozilla (1.5), Firebird (0.61), or Thunderbird (0.2). The reason is simple. These are terrific products, they really are. And they are free, although I encourage happy users to contribute to the folks at mozilla.org via PayPal or however you want. I'm currently using them at work on a Windows 2000 network (at least until the systems administrator realizes that I've switched from Internet Explorer to Mozilla.org), on a Windows 98 box at home, and under OS/2. As soon as I finish building a little server, I will also be using them under Linux, and if I break down and get a G5, I'll be using them on a Mac! Back to us in OS/2 Land; you'll want to grab the latest greatest builds of all of these products. To do so and stay current, go to the SCOUG web site at http://www.scoug.com (yes it's a plug), check out Gary Wong's latest Download! column, and click on the links he provides for the product of your choice. As Gary notes in the current column, there are three additional key sites. So How Does All This Stuff Work? OK, now you've got the files and the backup documentation, so we're ready to rock and roll. Or are we? I found out by a lot of trial and error that it helps to understand a little bit about where Netscape, Mozilla, and IBM/Mozilla puts files if you're going to do more than simply install and run the basic programs. For example, I didn't realize that if you're running eCS 1.1, you have probably installed IBM's Web Browser as a part of your setup, and it puts Mozilla files in a different place than you may be used to. It's also going to mean that you can't get other Mozilla versions to run on your system without a little bitty command file, or going to the new GCC code based versions like 1.5B. Trying to find out where files are by going to Netscape -> Users -> Profiles won't cut it anymore, because the ini and profile stuff you want is now in a folder called "Browser." Go figure. If you're running eCS 1.0 or Warp 4 FixPak 15 (or FixPak 16 if you have a Software Choice subscription), you don't need to know about any of this unless you choose to install the IBM branded version of the browser; as I recall, the default browser for them is Netscape 4. Just because it's easier, I recommend that you install Netscape 4.61 and the Plug-in Pak before playing with the Mozillas. If you're running Warp 4 that's likely your browser anyway. By having Netscape already on your system, if you use an installer to load Mozilla, it will pick up the Netscape bookmarks and plug-ins. Just in case you don't want to do this, or forgot, or have already moved way past this decision point, we'll cover all of the options. Here are all of the user settings for the browser. There are a couple of interesting files. First, you can see that I've set up different bookmarks between Netscape (a 62k file) and the IBM Browser (a 35k file). This will allow us to visually see what happens when you load each browser and how settings are and are not transparent between the programs. The second interesting set of files are those with a "*.js" file extension. These files contain user changeable browser settings and can be accessed with a text editor. Generally, by simply looking at the file structures, you can tell that the Mozilla builds are full featured browsers with all the goodies and lots of files, while Firebird and Thunderbird are much more stripped down faster limited solutions. OK, now we've done enough housekeeping for everyone's eyes to be glazing over. So let's go install Firebird on a stock eCS system. Since it's a zip file, you are going to unzip it to the root directory of whatever partition you want: in my case this was drive j:. Your directory structure should roughly match the one that I listed above. Almost done. Almost, because the new and future versions of Mozilla will require some GCC runtime libraries (remember, I said that Mozilla 1.4 was the last VAC++ based version. It was.). From here on out, the programmers have switched to the GNU C++ compilers; thus the requirement for these runtime libraries. Then, you can either copy them into the main Firebird directory or you can copy them to a general place that is in your path statement, such as (for example), f:\emx\dll, or f:\os2\dll, where they will be available for any other program which requires these libraries. Personally, I tend to put these files in the same directory as each program, because these libraries do change from time to time, and could cause problems eventually as new builds of Firebird or Thunderbird evolve. OK, almost ready. In fact, fire up the browser to prove that it works! You can either do it by going to a command line and typing "mozilla.exe" , or by creating a program object that points to this exe file. Now, about plug-ins and Mozilla. Here the best starting place is the web page we talked about at the beginning: the mozilla.org plug-in doc page. If the files aren't there, you can simply copy them to the plug-ins directory. If you have questions, take a look at the Innotek Java Readme.txt file. Wow! Were' almost done. What I find very interesting here is that unzipping the program defaults to a DriveX:\mozilla directory. On my system this means that I can have the IBM Browser (\browser), Mozilla 1.4 (\mozilla.org\mozilla), and Firebird (\mozilafirebird) all in the same partition without them stepping all over each other. Pretty neat! Of course this may change in future builds. So why Thunderbird, you say? For one reason, it's freeware, meaning just what you think it means -- only in this case, thanks to the Mozilla.org folks, the software is quite robust. Just as important, it's cross-platform, meaning that you can run the same software under OS/2, Linux/Unix, and whatever version of Windows you are forced to use at work. And amazing to me, this software has a dedicated group of programmers who are updating and upgrading the software at an astounding clip, unlike PMMail, MR2Ice and a bunch of similar programs in the OS/2 world. Oh yea, as a stripped-down mail/news reader, it also just happens to run a whole bunch faster than the mail client under Mozilla 1.4/1.5, while sharing a common heritage. This will result in a "J:\Thunderbird" directory structure after the files are extracted. Make sure that you have your c runtime dll's loaded in the Thunderbird directory, and we're set. Remember, after unzipping the files, you want to make sure that you copy the "c" library dll's into the mozilla directory. I mention this twice only because it seems to be the most common reason for folks to say that they "run the program and nothing happens." Actually, it is absolutely true that without the dll's the program will not run. Finally, create a desktop object using the program template, and you are all set. So far 0.2 is very nice indeed, and stable, and there is an 0.3 build in nightly testing as we speak. Setting up an account is very simple; just follow the prompts that appear from the main screen when you start up the program: Click on create a new account, select an e-mail account, give the appropriate server information, and you're set. By the way, Thunderbird comes with a neat junk filtering program that learns as you go! 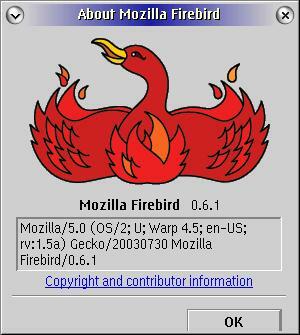 "You can run multiple versions of Mozilla/Phoenix at the same time, as long as you are careful. You must use different profiles for each version, and run a little script to start it (such as mozilla.cmd):"
MOZ_NO_REMOTE=1 keeps Mozilla from creating the parent message window, so two Mozilla's can no longer detect that each other is running. LIBPATHSTRICT=T forces DLLs to be loaded from the correct place, instead of using what is already in memory (this feature requires a recent OS/2 kernel). As my good friend Steven Levine says (Mr. Know-It-All in SCOUG circles), use these command files at your own risk! As the newer builds of Firebird and Thunderbird evolve, this stuff may not work anymore, or give unpredictable results. If you really want to have a browser and e-mail program open simultaneously, use a full featured program like Mozilla 1.4 or 1.5. They are really good. Or if you're like me and just can't help yourself, open Netscape 4.61 along with Thunderbird. The two coexist just fine. Gosh - this article has run on way too long. Hopefully it should give you the courage or insight to give these wonderful programs a try. Be aware that the code of these programs is changing quite rapidly, and the suggestions made here may only work with the versions listed. I'll try to do a more thorough article within the next couple of months. As always, e-mail me with your comments and suggestions: tony@scoug.com. Oh yes, it wouldn't hurt to drop a few bucks via PayPal to the good people at Mozilla.org.